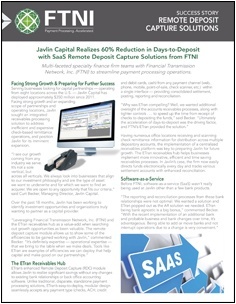 With an SaaS remote deposit capture solutions from FTNI, this multi-faceted specialty finance firm streamlined payment processing operations and gained an integrated receivables processing solution to address inefficient and expensive check-based remittance operations, and position Javlin for its imminent expansion. ETran’s enhanced Remote Deposit Capture (RDC) module allowed Javlin to realize significant savings without any changes to existing bank relationships or back office accounting software. Unlike traditional, disparate, standalone payment processing solutions, ETran’s easy-to-deploy, modular design seamlessly accepts any payment type (checks, ACH, credit and debit cards, cash) from any payment channel (mailed-in, called-in, in-person, mobile, online) within a single interface — providing consolidated settlement, posting, reporting and reconciliation. Before FTNI, software-as-a-service (SaaS) wasn’t really being used at Javlin other than a few bank products. “The reporting and reconciliation processes from these bank relationships were not optimal. We wanted a solution and ETran popped out as the AR solution we needed. ETran, being bank agnostic, is a big bonus,” commented Becker. As part of FTNI’s ETran integrated receivables hub, the ETran RDC module delivers the ability to scan checks and remittance advices while seamlessly associating and storing all account and payment information in a PCI-compliant, secure, central location. Growing business means growing transactions, and that means continually seeking new ways to streamline AR processes while integrating new, highly secure payment technology and processes along the way. For this multi-faceted specialty finance firm, FTNI is the long-term strategic partner that will help them not just keep pace, but lead.